Every first weekend of the month I provide The "FxTaTrader Forex Monthly Ranking and Rating" list on several social media locations. The lists can be found on this website and by searching for and subscribing to FxTaTrader on Investing.com, StockTwits.com, Talkmarkets.com and Twitter.com. The Monthly Metrics, which are the ranking and rating list with the Currency Score. Also the Monthly chart will be published in this article. The monthly articles will be published outside the weekend around the 1st of the Month. The charts do not contain too many indicators making them easy and clear to use. The slower indicators on a shorter Time Frame use more data for the calculation making them more accurate compared to a fast indicator on a longer Time Frame. The average trading period for the the Monthly is about 2 to 4 weeks. 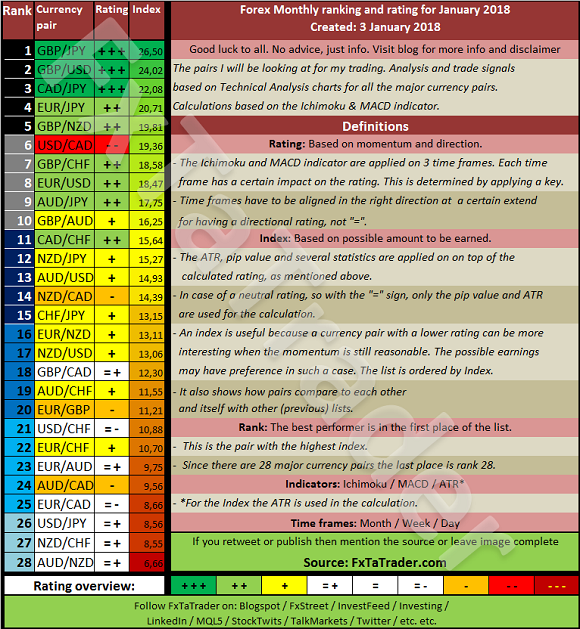 The Forex ranking and rating list is meaningful data for my FxTaTrader strategy. Besides this list I also use the currency score which is available once a month on this blog also together with my monthly analysis of my strategy. The list provides the ranking, ratings and index for the 28 major currency pairs. To determine these details I use the indicators that I rely heavily upon. These are the MACD and the Ichimoku. Here below you can see an example of the list that I publish on several social media such as Twitter. The roughly explained method here is a part of the strategy that I am using currently for the FxTaTrader system. This method is not used on its own and although the explanation may seem simple and clear there is always risk involved. I added a disclaimer to my blog for this purpose.